It does say a lot about the time written that Ringo writes "I wonder if he'll play with me" for the Paul verse whilst he knows John and George will play with Ringo when about. Thankfully that's all changed and they have played a lot together from the Eighties onwards. Actually coming to think of it is there any record before John's death of Ringo and Paul playing on the same record, I know they did at Eric's wedding but that was very informal and more jamming when drunk? Also is "cookies" a nod to John's "cookie" in Hold On ? Presumably it is and a cool one at that. Its a cracking song is Early 1970 and only a B-side! Ringo's voice actually sounds the most like the music/singers I grew up with. I find the familiarity comforting. It's time for me to get some Ringo cds. Yeay. Ringo would be happy. His first couple of albums (pre-Ringo) have a very comforting feel to them and are good to hear. I've been trying to find some of his albums in Glasgow but nothing, not even a greatest hits. Even with George you're lucky to find anything aside from All Things Must Pass and the Bangladesh concert, very occassionally a copy of Living In The Material World or Cloud 9 will appear but nothing else. I'm surprised at you asking that, mmm. On 1973's Ringo Paul contributed "mouth sax" to You're Sixteen and wrote Six O'Clock on which he played piano and synthesiser, contributed backing vocals, and came up with the string and flute arrangements. On 1976's Ringo's Rotogravure Paul contributed Pure Gold, recording the backing track with Linda while on a break from the Wings Over America tour, and supervising Ringo's vocal overdub on 19 June. On 1981's Stop and Smell the Roses several tracks appeared that had been produced by Paul between 11 and 21 July 1980. Private Property and Attention were both McCartney originals and Sure to Fall was the Carl Perkins song The Beatles had often performed. Paul played bass and piano on all three, as well as contributing backing vocals. The 1994 CD reissue added another track from the same sessions, the Starkey composition You Can't Fight Lightning - bizarrely this featured Ringo on guitar and Paul on drums. Five different instruments he plays in one song! Even hauls out a standup bass and plays eight shaky notes just to demonstrate his inability - and by extension, his need for musical collaborators. Great, great record. ^and don't forget, even though those are both credited to Ringo, George really wrote them (as evidenced by his home demos of both songs!). Still, great sounding single, both sides, that. I have a "modest" musical gift. I can read and write music, but the "nuts-and-bolts" playing of a keyboard instrument has never come easy or felt very natural for me. So, for years, when describing my limited abilities, I'll say "I play the piano if it's in C." Now I remember where I first heard that line... the obscure "Early 1970." What a charming song. Someone really should slap me for asking such a question as the answer was so damn obviously yes. Mja, i apologise for wasting your time as well as thanking you for taking the time to reply. Did George write Early 1970, i know he wrote It Don't Come Easy? Charming indeed. Very cool song. I love how the other three wrote nasty songs about each other and Ringo wrote this. Aw. Thanks for posting this; I'd forgotten about it. Shows how crucial Ringo must've been to their interpersonal dynamic, aside from being a great drummer. MMM - Ringo is credited with it, though as with the a-side ("It Don't Come Easy") there are the stories that George had a lot to do with it. For me, it sounds like Ringo this time, plus he has the production credit (unlike the a-side which is George). It is indeed - and if you only get one the 2007 "Photograph" hits CD is just plain awesome - particularly if you can find the version with the bonus DVD of video clips. The liner notes are very good for that CD as well, you get a real peek inside Ringo's brain (which is probably safe now, not so much in the '70s - it seems he can't recall much from the whole 1974-84 decade due to booze / drugs etc.). No wonder that was a relatively weak time in his career. [EDIT] Oh, and the song that started this thread is on there - and very nice it is too! Doesn't sound or look like a George lyric and whilst hearing about how he had a very large hand in It Don't Come Easy (possibly all of it) have never heard anything about Early 1970. Yeah, I don't see any reason why Ringo couldn't have written "1970" all by hisself. It's just a few country & western chords and some simple rhymes. 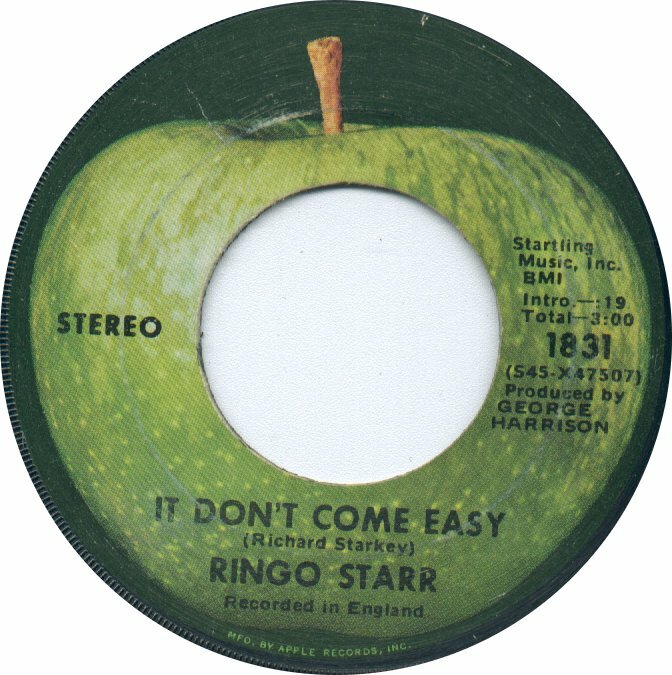 "It Don't Come Easy" was a bit more sophisticate. But like I said, I'm not even sure if "Early 1970" is credited to Ringo alone. If George's name is on it, then he had a hand in writing it. Ringo is the sole creditor on Early 1970.
to see George waived his songwriting credit for IDCE.